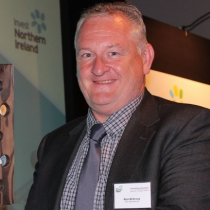 Managing Director of ATG Group, Dr Mark McKinney, attended The Industrial Symbiosis Business and the Environment Conference on May 31st, 2017 to receive the Gold Standard Award for demonstrating an exemplary commitment to Industrial Symbiosis. The Industrial Symbiosis Service finds economic and sustainable ways for businesses to let their waste or excess resources be used to the benefit of another business. The service is delivered by International Synergies NI on behalf of Invest NI and works with businesses of all sizes and from all sectors. With its 1900 members, the Industrial Symbiosis Service has facilitated over 450 synergies since 2007, resulting in 392,000 tonnes of waste being diverted from landfill and marked their 10th anniversary by paying tribute to the people and organisations who have shown outstanding engagement. 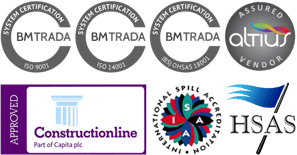 ATG Group was first involved with the Industrial Symbiosis Service at a synergy workshop and through the service has developed links with other companies leading to several projects. One of these projects led to ATG Group winning this award. Braidwater Ltd were the building contractors for a housing development in Belfast where significant amounts of contaminated land had to be dealt with before construction could begin. Thanks to the Industrial Symbiosis service ATG Group were approached by Braidwater and explained their aim to reduce costs by diverting the contaminated material from landfill. Both companies agreed on a strategy involving the removal of 38,304 tonnes of waste. 12,888 tonnes were classed as inert material and used as fill under an NIEA exemption at another Braidwater site.